Welcome to NHL Golf store, your one stop shop for NHL Logo golf gifts and accessories. 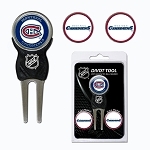 We are proud to supply a variety of high quality gifts for avid NHL fans and golfers. Please take your time to browse our store and call or email us if you have any questions. If you are looking for NCAA, NFL, or MLB logoed gear, please check out one of our other storefronts respectively collegegolfstore.com, NFLgolfstore.com, and MLBgolfstore.com or our new non-golf merchandise storefront UltimateFanstore.com.